Director Pamela Romanowsky‘s debut feature is not a meek choice. Tackling the page to screen adaptation of Stephen Elliott‘s memoir THE ADDERALL DIARIES seems like something that was written in the stars. Speaking of stars, the film is lead by an outstanding performance by James Franco as a pill popping, destructive behavior addicted, emotionally ravaged man. Under the guise of writer’s block, Stephen lets himself become distracted by a murder case that seems to resonate with his memories of the past; memories that have made him a famous author so far. When his father’s ghost returns to haunt him, life spirals into an seemingly endless line of poor life choices. One person’s truth may not be what it seems. On the heels of TRUE STORY, Franco plays Elliott with a ferocity that is totally organic. Hitting highs and lows so sharp, I can safely say I am impressed. Ed Harris portrays his strong willed father. A constant trigger throughout the film, this role was made for Harris, literally. Amber Heard is beautiful and honest as a NYT journalist fighting childhood demons of her own. Christian Slater is charming as ever and a master of emotional disguise as the subject Stephen longs to understand. Cleverly edited and stunningly shot, THE ADDERALL DIARIES is a sensory and emotional overload of a film. You will find something that connects with you, I guarantee it. I was fortunate enough to sit down with Pamela Romanowsky and talk about the journey that became this project. Liz: Just saw the movie and I really liked it. How did you happen upon Stephen’s novel? Pamela: Well, there are two parts to this story. I first happened upon it because I live near a really great independent bookstore called “Word” in Greenpoint. I saw it in the window and that is often how I buy books, ” What does Word have?” So I just read it as a casual reader and loved it, thought about it a lot, it really stayed with me. It’s the kind of story that takes a lot of processing. Then separately from that, James Franco and I went to grad school together and are good friends and we hadn’t worked together yet. Then I had the opportunity to make the short with him for The Color of Time. We had a great creative connection and a great time working together. James approached me with The Adderall Diaries. I actually just found out yesterday that it was the first book he optioned. L: He is such a fan of page to screen, all of which so far have been really successful. It’s such a bold move because it can go so wrong. P: He picks Difficult books. P: It was a really great moment of synchronicity. He wanted to help me make my first feature and with a book we both loved. L: I think his performance was one of his best and so clearly has a lot to do with your relationship. You had such a great cast full of talent. Ed Harris, what a juicy role for him. I also really enjoyed the juxtaposition of memories talk to me about the editing choices. P: I developed the visual style with my DP who was also a collaborator from grad school. I met a lot of my people there. Bruce also shot my piece for The Color of Time so we had already talked about how to approach memories cinematically. We used steady cam alot because it felt organic. This is a character who is always in motion, and practically it allowed us to shoot quickly, to be intuitive, to find shots within the scene as we went. And the use of slow motion… you know memory is such a hard thing to describe to someone else but to me, the things that you tend to recall over and over are these small moments and details so it almost like you’re seeing it in slow motion. L: it is incredibly effective. It is so aesthetically beautiful. Did you guys have a lot of rehearsal time? Everything feels really organic. Yet there are some truly physically demand scenes. P: I think as is often in indie film, but I had the advantage of knowing a lot of these actors and Ed, I met at the Sundance Directors Lab. L: Had he been cast already or did he just come in and read for you? P: No, he was my advisor at the lab. Coincidentally he was also the person I wrote this role for! His photo was on my writing board the whole time but I never actually thought I was going to get a chance to meet him. 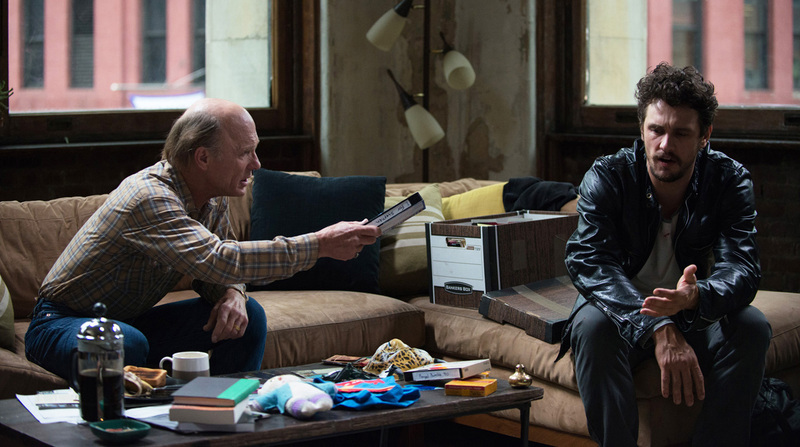 So when we were at Sundance, low and behold Ed Harris walks in and I was like ” Oh my God, Ed Harris is here!” It just happened that he was there, it just happened that he was my advisor, and it just happened to be the week I was shooting my father/son scene. So when he was leaving I had to tell him, “You know, thank you so much for helping me and so I wrote this role for you and I don’t know if you’d ever think about doing it but I am gonna keep asking you forever.” And truthfully I didn’t have a back-up plan, I didn’t see anyone else playing this role. It took me 9 months to talk him into it. So I had a lot of time to talk it over with him. It was the same with all the other actors. Rehearsal is really important so right before we would shoot each scene I would kick everyone out and we would run the scene through. L: As soon as I walked out of the theater I said, “I have to buy this book now. I am completely intrigued. I have to read it.” It has so many relevant issues that even if you’ve never experienced them personally, you would gravitate towards this story. We all have our own way to interpret what our memories are. And I think the older you get and the longer you live with your interpretation, that becomes your truth. It was beautiful to see that on screen. Thank you so much for talking with me. P: Thank You! Enjoy the rest of your fest! L: You too! I look forward to talking to you for whatever comes next. THE ADDERALL DIARIES ticket and showtime information can be found here in the Tribeca Film Festival Guide 2015. This entry was posted in Book to Film, Film Festival, Go To The Movies, Interviews, Liz, New York City, New York City, Page to Screen, Reviews, Screenings, Tribeca Film Festival, What To Watch This Week and tagged addiction, amber heard, christian slater, drama, drugs, Ed Harris, interview, James Franco, memoir, memories, narative, pamela romanowsky, Review, stephen elliott, tff, tff2015, tff2015 liz, the adderall diaries, true story by Liz Whittemore. Bookmark the permalink.